Yogurt and cheeses and milk, oh my! June is National Dairy Month! Dairy products are good sources of vitamin D and calcium – nutrients vital to good health. How much do you need? 3-A-Day, that’s 3 servings of milk, cheese or yogurt! Vitamin D has several essential bodily functions. Not only does it maintain blood calcium and phosphorus levels, but it also aids in the absorption of calcium to form and maintain strong bones, works with calcium to increase bone density, and decreases fractures. Recent studies show that vitamin D may also protect against osteoporosis, hypertension, cancer, and several autoimmune diseases! Here’s one sweet recipe that doesn’t skimp on dairy or flavor. In a single layer on a plate, freeze the banana slices for at least 1 hour (or overnight). 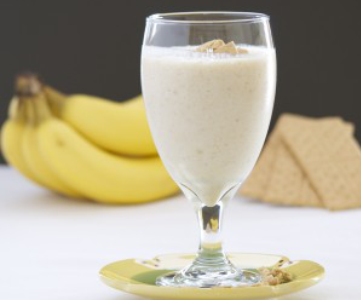 Add the frozen banana slices, yogurt, water, milk powder, honey, and vanilla to a blender container. Cover and puree until smooth. Pour into a chilled glass. Tip: Freeze any leftover smoothie in popsicle molds for a frozen treat anytime!